Thank you for your support during this difficult time. Please enhance this tribute to Maddy by adding your memories. 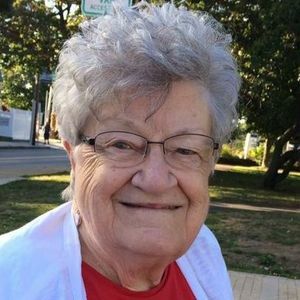 Madeline L. (Grippen) Herron Collins, of Winthrop, formerly of Chatham, age 89, died on Friday, March 22, 2019 at the Kaplan Family Hospice House in Danvers. She was the wife of the late Andrew C. Herron and the late Joe B. Collins. Born in Brockton and raised in West Bridgewater, she was the daughter of the late Charles and Mildred (Pratt) Grippen. Madeline's best days through the years were her summer days at the beach in Chatham with her family and friends. In her later years she enjoyed spending time with her friends on the Cape. For many years she enjoyed cooking and entertaining her family and friends. She is survived by her children Sandra Herron Grover and her husband John, Janet L. Herron, Wendy L. Herron and Robert Herron, five grandsons, Matthew, Adam and Evan Grover, Andrew J. Roach, Corey and Jake Herron and five great grandchildren. She leaves her sisters, Barbara Hollenbeck, Betty Johnson, Sandra Hopkins, a brother George Grippen and many nieces and nephews. She is the sister of the late Geri Olsen, Charles Grippen, Robert Grippen, Peter Grippen and Bruce Grippen. A graveside service will be held on Wednesday, March 27, 2019 at 1:00PM at the Seaside Cemetery in Chatham. Relatives & friends respectfully invited to attend. Arrangements entrusted to the Gately Funeral Home, 79 W. Foster Street, Melrose, MA 02176. I never met Madeline but for the past 13 years have talked with her daughter, Wendy about the care and love she had for her mom. My condolences to the entire family; may she rest in peace and may the family carry her in their hearts. So sorry Wendy. Life Stories provides friends and families a forum to post their favorite stories and memories of Madeline L. (Grippen) Herron Collins ensuring the precious experiences are never forgotten. Share joyful times, post a photo that captures the moments you cherish, and allow others to reply, relive and remember.